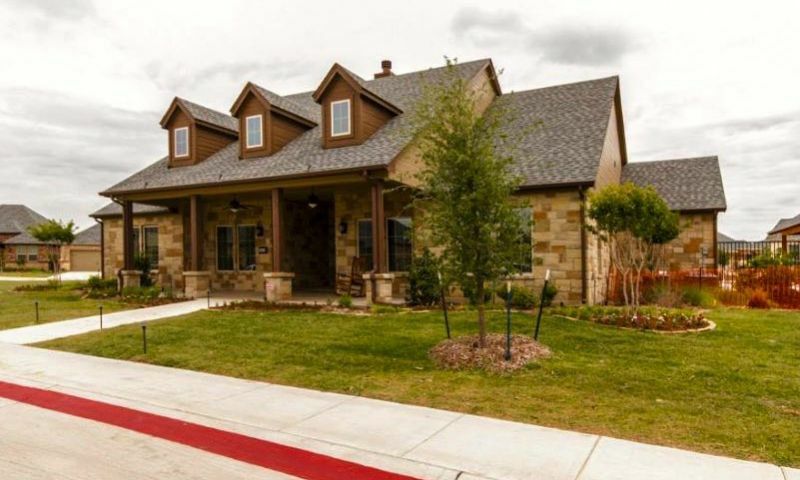 Villas of Stone Glen is a quaint active adult community located in Keller, Texas. Built by renowned active lifestyle developer Epcon Communities, Villas of Stone Glen continues their tradition of building functional yet charming homes with amenities sure to keep residents physically and socially busy. Villas of Stone Glen is located in highly sought-after Keller, Texas, boasting golf courses, lush open spaces and terrific restaurants. At the center of Villas of Stone Glen is the 3,000 square-foot clubhouse. The clubhouse features an exercise room for breaking a sweat. Residents plan community events in the multi-purpose room, small gatherings in the meeting room, and watch the big game in the media area. A catering kitchen is also available for preparing snacks for any event. The great amenities continue outdoors with a pool and patio to enjoy a relaxing day with neighbors. Residents can prepare a meal for friends in the barbecue area before gathering around the fire pit. A walking and biking trail weaves through the community, allowing residents to go on an invigorating jog. Villas of Stone Glen will feature 115 single-family homes upon completion. Epcon Communities offers four separate floor plans that range in size from 1,607 to nearly 2,000 square feet and offers two or three bedrooms, two or three bathrooms and an attached two-car garage. All homes come with optional second floors, open floor plans, incredible outdoor living spaces, and energy-efficient designs. Living within Villas of Stone Glen means enjoying a low-maintenance lifestyle. Thanks to a homeowners’ association fee that covers exterior home maintenance, roof maintenance, landscaping and common areas, residents will have more time to enjoy their hobbies and pursue their goals. The maintenance-free lifestyle also provides more opportunities to get to know your neighbors. Residents are constantly planning fun events like barbecues, holiday parties, ladies’ lunches and card games. Villas of Stone Glen is located in Keller, Texas. In 2009, Money Magazine ranked Keller as the seventh best place to live in the United States. Villas of Stone Glen is also located in a very convenient area, just one mile from a Kroger, Tom Thumb and Keller Town Center. The Harris Methodist Hospital is just over four miles from the community entrance while the Dallas - Fort Worth International Airport is just 14 miles away. Villas of Stone Glen also provides close proximity to dozens of restaurants, movie theaters and several parks for recreational activities. There are six golf courses within an eleven-mile radius, ensuring golf lovers that their next swing is never far away. Villas of Stone Glen in Keller, Texas provides a terrific active adult lifestyle within and outside of this 55+ community. Activity Center - 3,000 Sq. Ft. There are plenty of activities available in Villas of Stone Glen. Here is a sample of some of the clubs, activities and classes offered here. Epcon Communities offers four separate floor plans that range in size from 1,607 to over 2,100 square feet and offers two or three bedrooms, two or three bathrooms and an attached two-car garage. All homes come with optional second floors, open floor plans, incredible outdoor living spaces, and energy-efficient designs. 55places.com is not affiliated with the developer(s) or homeowners association of Villas of Stone Glen. The information you submit is distributed to a 55places.com Partner Agent, who is a licensed real estate agent. The information regarding Villas of Stone Glen has not been verified or approved by the developer or homeowners association. Please verify all information prior to purchasing. 55places.com is not responsible for any errors regarding the information displayed on this website.